Update 3/5/18: Used new dynamic table. Here are 173 short fiction writers reviewed by Rocket Stack Rank who are eligible for the 2018 Campbell Award. They were selected from the 746 stories reviewed by RSR in 2017 as well as the 821 stories reviewed in 2016. There are many more new writers than the ones in this list, but their stories weren't reviewed by RSR so they're not included here. Authors: If your story was reviewed by RSR in 2017 and you are eligible for the Campbell Award but your story is not listed below, please leave a comment so we can update the list. 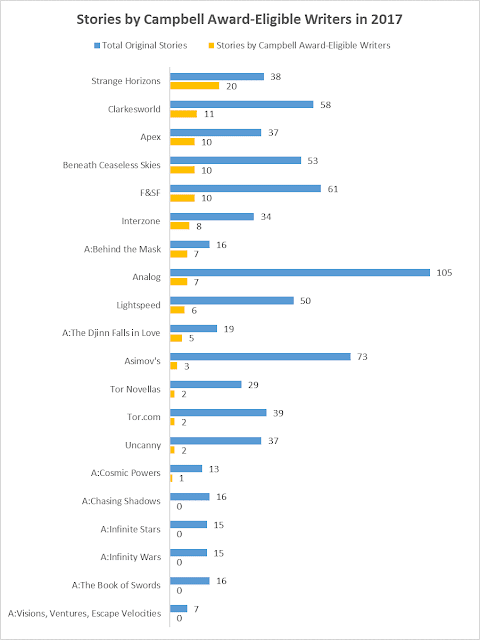 This chart gives you some idea which publications are most likely to publish stories by new authors. Navigate big tables with Jump to...Section 1Section 2Section 3 . See your ratings with My Ratings . They're grouped by Category to simplify Hugo nominations. Allison Jamieson-Lucy is first year Campbell eligible. Thanks for the info. I've updated the spreadsheet. I'll wait a day or two for any other corrections and then regenerate this post with all updates. Hi, just a question: Why is Hanuš Seiner listed as in his 2nd year of eligibility? His stories were first published in 2017; nothing in 2016. Thanks for the correction. I've updated it in the spreadsheet and will regenerate the table soon. Both tables have been regenerated for the two writers above. Aimee Ogden is in her second year of Campbell eligibility. In his editor's note for F&SF Jul/Aug, C.C Finlay mentions that "Afiya's Song" was Justin C. Key's first pro sale. In his note for F&SF Sep/Oct, he said that "We Are Born" was Dare Segun Falowo's first publication. I only see 2017 credits for both Lorenzo Crescentini and Emanuela Valentini in isfdb. Both tables have been regenerated for the five writers above. Meg Elison (Big Girl, F&SF 11.12) is in her 2nd year of eligibility. She mentions it on her blog, and she's on Writertopia's Campbell page. Fixed with today's table refresh. Katherine Arden for The Bear and the Nightingale, I believe she is eligible. I believe you're right, but she's not listed here because Rocket Stack Rank only covers short fiction. Jeannette Ng is on my radar because of her novel "Under the Pendulum Sun", but ISFDB also has two short fiction credits for her - "Three Hundred Years" in Mythic Delirium, Issue 2.3, January-March 2016, and "Goddess with a Human Heart" in Shoreline of Infinity, Issue 8, Summer 2017. Thanks for the info, but we don't have reviews for her short stories in our spreadsheet so they can't be "auto-generated" for the tables in this article. According to Andrea Tang, she's in her first year of eligibility. I've just read "The Bear and the Nightingale" by Katherine Arden. This is an excellent fantasy novel, imo, in case anyone is needing a Hugo novel recommendation.